The number of people injured in the Valley in the last four days is at approximately 1,400. Srinagar: Five days after the killing of Hizbul Mujahideen leader Burhan Wani, Kashmir remains on the boil. 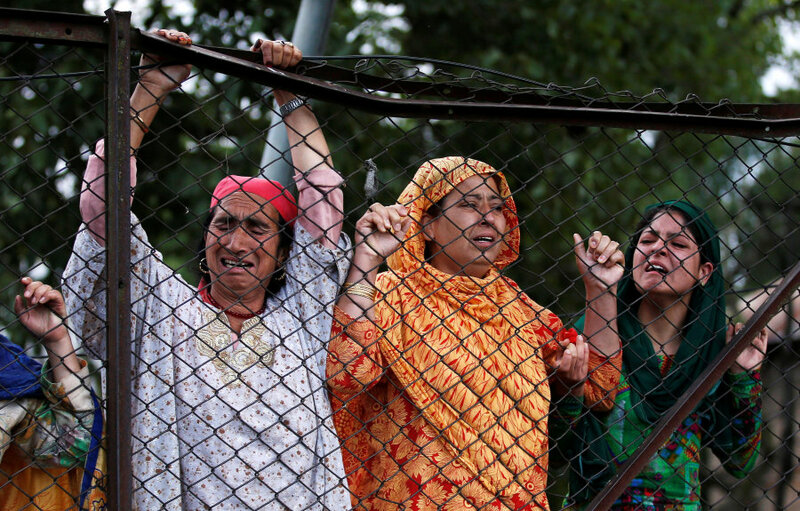 Sporadic violence left one person dead on Tuesday, raising the death toll to at least 32. The number of people injured in the Valley in the last four days is at approximately 1,400, reports said. One person was killed in firing by security forces in the Kupwara district of Kashmir, police sources said. Another person, a student of Delhi University back in the Valley for the holidays, was injured during police and CRPF firing on Monday evening and succumbed to his injuries on Tuesday, reports said. Mufti, according to the Indian Express, warned the police against use of excessive force. “Instructions were passed to security forces to exercise restraint while dealing with people. Unfortunately, despite this, many lives were lost,” the Indian Express quoted her as saying. She said that the police would “be made answerable” if found to be using excessive force. There were some other incidents of violence, including a militant strike on a police post and a mob attack on the family of a police officer in which his wife and daughter were injured. Mobile internet and train services remain suspended in the state. Mobile network has been cut in the Kupwara area following the death of a young person during protests yesterday. Mobile networks are also partially suspended in four south Kashmir districts. Chief minister Mehbooba Mufti on Tuesday asked parents to keep their children away from the stir and not allow them to go out after curfew, reports said. She blamed “vested interests” for the violence and said it would result in nothing but bloodshed. Injured people have been admitted to hospitals across the Valley for wounds caused by bullets, pellets, tear gas shells and lathi charge. Doctors treating injured protestors said that police bullets have been aimed to hit protestors above the waist, reported Hindustan Times. Doctors have also heard numerous allegations from injured persons that they were attacked by the police and the CRPF without any provocation. “How can we justify this wanton use of force? In many cases bullets and pellets have been fired above the waist. The objective definitely seems to kill or maim the person for life,” a senior doctor at Srinagar’s Shri Maharaja Hari Singh Hospital told Hindustan Times. 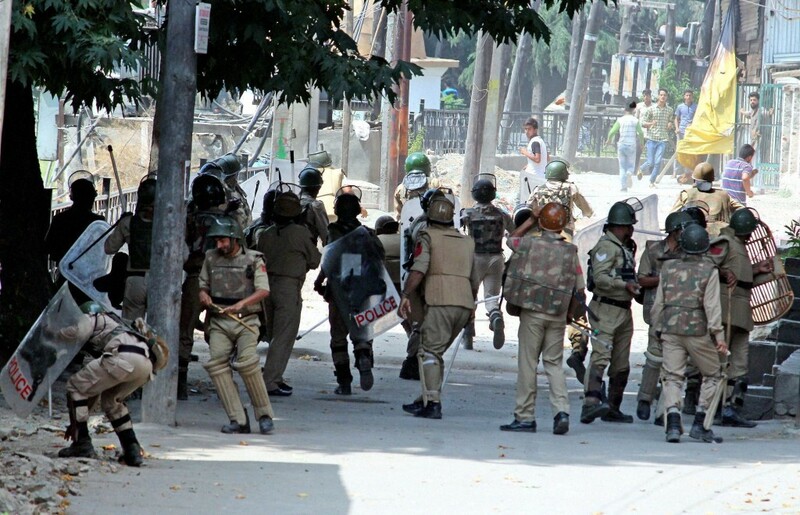 According to an Economic Times report, 12 CRPF troopers were injured on Monday evening when someone, from a behind a crowd of stone-pelters, hurled a grenade at the forces in Srinagar’s Nowhatta area. Intelligence agencies called this development dangerous. “Militants using stone pelting mobs as cover is a serious development. This would blur the distinction between civilian protesters and militants,” said a senior intelligence official. Prime Minister Narendra Modi held a high-level meeting in New Delhi to discuss the situation in the Valley on Tuesday, on his return from a trip to four African countries. The meeting was attended by home minister Rajnath Singh, finance minister Arun Jaitley, external affairs minister Sushma Swaraj, defence minister Manohar Parrikar, minister of state for PMO Jitendra Singh, national security advisor Ajit Doval and foreign secretary S. Jaishankar among others. The ministers were briefed by chiefs of central security agencies about the steps taken to bring back peace and normalcy in the Valley. “He has appealed to the people of Jammu and Kashmir to maintain peace so that the situation can normalise. He also expressed hope that no innocent person should face any kind of inconvenience or loss,” Jitendra Singh said after the meeting. He added that the prime minister had voiced concern over the situation and appealed for peace. Modi also expressed “unhappiness” at media coverage on the situation, reports said, saying that they were portraying Wani as a “hero”. Parrikar told reporters that an overall assessment of the security situation in Kashmir has to be done by the home ministry and the army was ready to provide any assistance needed, including increasing forces. Earlier, the home minister had reached out to opposition leaders including Congress chief Sonia Gandhi, former Jammu and Kashmir chief minister Omar Abdullah and parliamentary leaders of all parties in order to discuss the situation. Meanwhile, reports have quoted home ministry sources as saying, the ministry is worried over the situation in Kashmir Valley in next few days. July 13 (Wednesday) is commemorated as “martyrs day” in Kashmir and Friday prayers see a large number of people gathering.